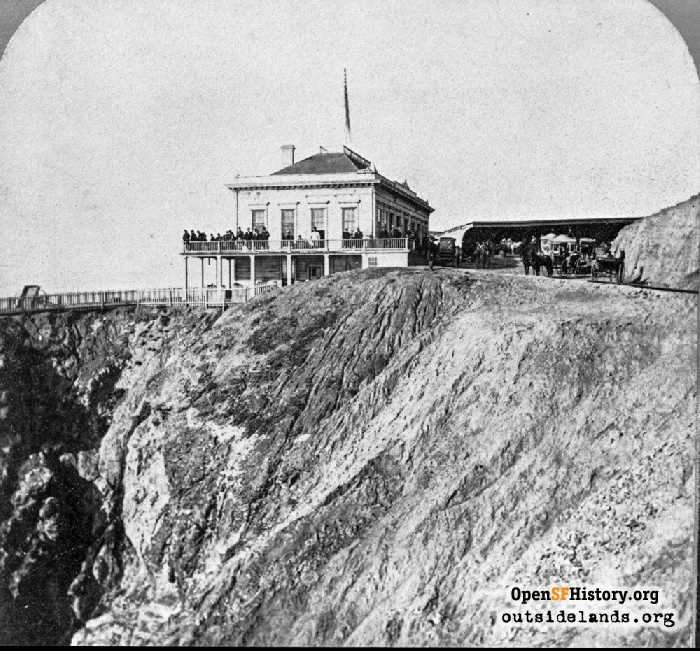 Charles Butler, a real estate speculator, built the first frame-and-clapboard Cliff House on the edge of the ocean in 1863. Above the surf of the Pacific Ocean, overlooking Seal Rocks—a cluster of stones that until the 1990s was very popular with basking sea lions—the Cliff House has entertained capitalists and presidents, rapscallions and gamblers, servicemen and women departing to war, natives and generations of tourists, for more than 150 years. On a rocky point just uphill from Ocean Beach, real estate speculator Charles C. Butler built the first Cliff House in tandem with the Point Lobos Toll Road. The roadhouse’s start and success was highly dependent on the creation of the toll road, which ran from Lone Mountain to the sea, and it may be no coincidence that Butler received financial backing from State Senator John P. Buckley, who was in a position to grease the wheels to get the franchise for the road’s creation and was a corporate officer of the toll road company. 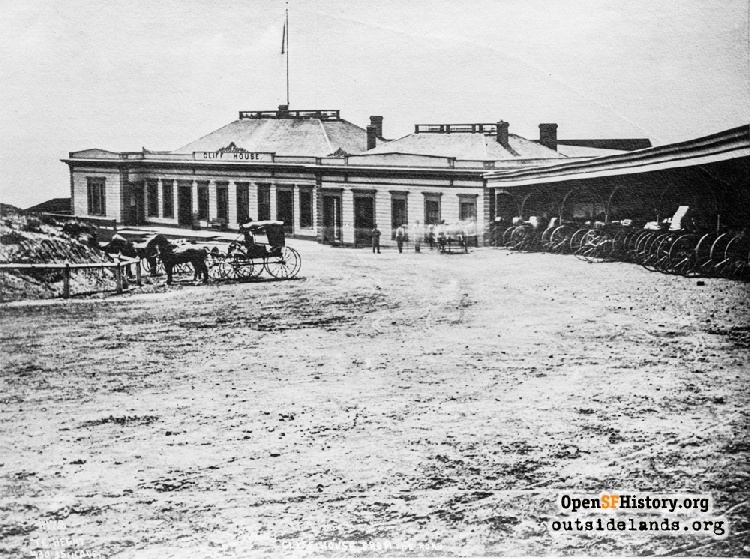 The Cliff House opened on July 4, 1863, with well-known host Captain Junius G. Foster as the manager. Although occasionally described as a hotel, the simple frame-and-clapboard structure served only as a restaurant and bar. The prime attraction beyond the usual food and drink was the view, with windows and balconies offering the wide ocean and the sea lions on the rocks below. Early morning rides to the Cliff House for breakfast became a fashionable activity, for those who could afford the toll to get there and the menu prices on arrival. After a series of these newspaper paeans to early morning rising and riding to the Cliff House (many interjected with classical poetry to convey the sublimity), Mark Twain in 1864 took his own trip and gave a curmudgeonly, if humorous, account. When the ride, the view, and the sea lions weren’t enough to draw out the crowds Captain Foster booked balloon ascensions and acrobatic spectacles. Seal Rocks proved a great target for daredevil swimmers and wire walkers such as James Cooke and Miss Rosa Celeste, the female funambulist who attracted five thousand people to witness the “greatest rope-walking feat ever performed by a woman.”2 Celeste made the 400-foot journey across to Seal Rocks, 100 feet above the surf, without guide wires for her balance pole, on June 24, 1866. The Cliff House was expanded in 1868. Presidents Grant and Hayes came to dine in 1879 and 1880. 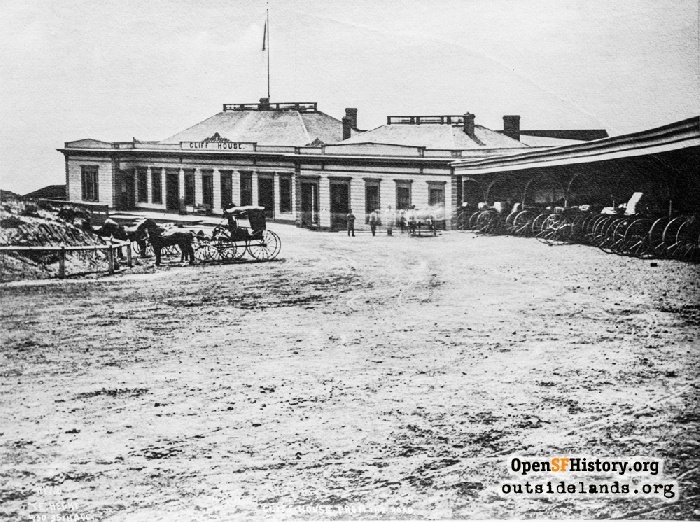 Ordinary folks without horses and carriages, who had to pay as high as 50 cents to take omnibus lines (large coaches pulled by teams of horses) out to the seaside, began arriving in droves when the monopoly on road traffic to the beach ended with the creation and improvement of free roads through the new Golden Gate Park. Beginning in 1883, a nickel could bring a workingman to present-day La Playa and Balboa streets on the Pacific and Ocean Railroad. High society began to abandon the no-longer-exclusive Cliff House for fancier and more elaborate resorts. Captain Junius Foster, who still leased the roadhouse, adapted to the loss of business by courting to a more "sporting" clientele. 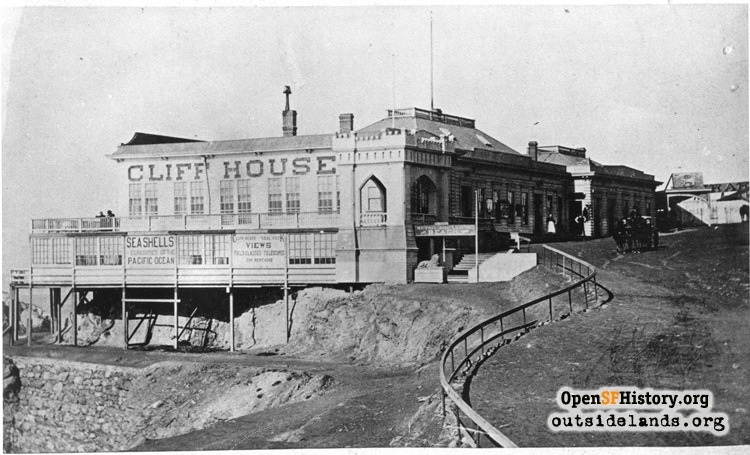 Before long, the Cliff House became known as a den of gamblers and illicit behavior. While losing a wing and most of its windows when the ship Parallel exploded on the rocks in 1887, the Cliff House continued to be popular. What a ship of exploding dynamite couldn't do, a simple kitchen fire did in 1894. On Christmas night of that year, the roadhouse that had in thirty years grown to become a San Francisco landmark burned down. 1. “The Point Lobos Turnpike—The Drive, the Cliffs, and the Seals,” San Francisco Bulletin, July 9, 1863, pg. 3. 2. “M’lle Rosa Celeste,” San Francisco Chronicle, June 25, 1866, pg. 3. “Tight-Rope Walking,” Daily Alta California, June 23, 1866, pg. 1. 3. “Mooney’s Mansion,” Daily Alta California, December 24, 1883, pg. 4. 4. “The Sutro Luncheon,” San Francisco Call, April 28, 1891, pg. 1.